– The MXit website (mxit.com) is already translated to some other languages (Spanish, Portuguese, French, Italian, German and Brazilian). – AE128 content encryption will shortly be standardised on the MXit system (with a view, MXit says, toward creating a foundation for financial transactions). V5.2 is just a minor’ish update. Smooth Scrolling – Hold in up and down, no need to press up/down repeatedly. Under settings – login: You can change the connection type: auto/http/socket: half duplex/socket: full-duplex. This is for phones that might have problems connecting. A “3 soft button mode” – if you want to use a third shortcut button at the MXit bottom bar. (“Options” and “Back” are “soft keys” when you are talking to a contact.) Having three will give you “Write” as a softkey, for quicker access. As well as other options on other screens in MXit. i-Mate / HTC phones do not have much extra java APIs (no file access, no sending of SMS, no access to the camera from within Java), so the extra feature will be the ability to download skins. 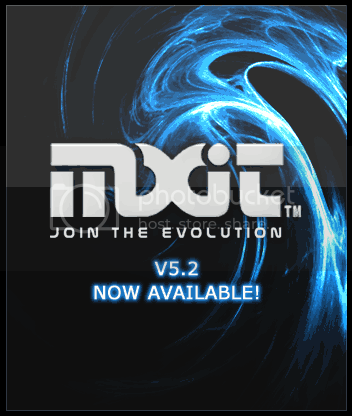 I managed to find the MXit V5.2 beta before it was released, but I’m not a person to break trust, so don’t even ask 🙂 You will get it soon! An option is now available to encrypt user to user messages using 128 AES. The encryption is performed using a shared password. When logging in the password is also encrypted. A further encryption option allows services to communicate with a client using encrypted communication. Adds the ability to play audio files from within MXit. Note that this feature is not available to all handsets. The ability to scroll through the contacts list and chat screen by holding in an arrow key (instead of having to press it repeatedly). Multimedia file types are charged at 15 Moola per broadcast. The interval that must elapse before the user’s presence is set to away automatically can now be configured in Menu -> Settings -> Presence. The user can now configure whether a middle softbutton action should be available where applicable (default for Nokia handsets). Modify the presence state and mood indicators that are shown in the heading bar of the conversation screen to refer to that contact instead of to the user itself. This will make it easier to see if the mood or presence state of a contact changed, while talking to him/her. Added support for multiple languages. The choice of language is made during the download process. If a connection cannot be made using sockets, the client will fall back to HTTP mode. The maximum size of a message that can be sent has been reduced to 1000 bytes (from 2048) to save memory. 1. Samsung D900 / E250: Fixed local file system access problems. 2. Samsung D900, Motorola V3X: Fixed file sending. 4. Nokia S60: Phone camera is now available while MXit is running in the background. 5. Samsung E250: Skins, Local file access now supported. 7. Nokia S60 2nd Ed FP 1,2 (including Nokia 6670 and 7610): problems with updating the Profile fixed. 8. Don’t try to login any more if the logout call fails. 11. Screen is now updated properly if contact’s mood or presence changes while the contact’s chat screen is open. 12. HTC: Settings are now saved properly in the record store. 13. Invites cannot be moved to a group any more. Will the new mxit work on the lg kg800 chocolate phone ? Because it cant moola topup and how must i get the new mxit from tradepost if i cant access it ? Yes it will always work with the new version, if there was a old version for it before! You don’t need moola to access Tradepost! Only if you want to purchase stuff from it. You can moola topup! By sending an SMS/TXT as it tells you to in Tradepost! In MXit, subscribe to Freestyler in Tradepost (the contact called Tradepost), and then it will let you know when you can get the new MXit V5.2 Beta! After a few days/weeks, everyone else can! hey guys.seems they were wrong wen they said v5.2 works on the lg kg800 coz it shure doesnt.seems im waisting my money nd time on becomming a freestyler.let me know if this is a bug or just another scam. Hay, It must be frustating, sorry! What part of MXit doesn’t work? Another scam? Where was the other scams? I would like to join these evolution.